On Sunday afternoon [October 7], considerable excitement was created in William Street, which soon spread all over the city, by reason of its becoming known that a young woman, a servant in the house of Mr. Haynes, flour dealer, 42, William Street, had been found dead in her bed that morning, under circumstances which, according to current reports, would lead to the suspicion that she had not died a natural death. Crowds composed of the most part of females, continued to assemble in front of the house, discussing everything which was known or rumoured relating to the unfortunate young woman. Until the termination of the inquest, it would, however, be improper further to advert to these unauthenticated statements. Information was sent to the police, who at once came to the premises, and sent a despatch for the Coroner. On Monday [October 8], the matter having become more generally know through the city, the excitement became still greater, the crowds of people in front of the house much larger, and it required the active exertions of several of the constabulary during the day to keep the pressure of people from the door. The house was shut up all day, and the flagway and more than half the middle of the street was quite impassable, from the crowds of people. The deceased, Honora Burke, aged 18, was servant in the house and the family consisted of Mr. and Mrs. Haynes and Mr John Haynes, brother of the owner of the house. It was known the deceased was enceinte, and was within two months of her confinement. The body lay on a table in the kitchen, close to the window, and could be seen by people above though the grating in the flagway, a circumstance which increased the curiosity and clamour of the crowd. It was intimated that the inquest would be held at one o’clock, and while the police were collecting a jury, the Reporters of the Press, and a few others, were admitted, but so great was the rush that the Police on the door had a considerable difficulty in keeping passage only for the jurors, witnesses and officials whose presence was required. At one o’clock the Coroner, Dr. W.C. Murphy, arrived, and the hollowing jury was sworn:- David Johnston, Foreman; James Macauy [? ], James McGee, Francis Vanesbeck, Ambrose Hall, Michael Cusack, Thomas R. Hamilton, William Purcell, Richard Coffey, David Landers, P. Genoux and Joseph Todhanter. The jury then proceeded to view the body. It was that of a well-featured young woman; the face much swollen and head, the neck and right arm much discoloured, and the hands in a rather cramped attitude, raised over the upper part of the breast. Mr. [Dr.] Edward Homan sworn – Deceased got some medicine about a month since – a bolus and a draught; witness desired her to come again but she did not; it struck him that was pregnant but she did not admit; she complained of a swelling in her stomach and violent headache; she would not submit to any examination. Witness here became weak and had to leave the room for a short time; he seemed quite nervous and confused. On his examination being resumed he said the noise was like as if she slept uneasy in her bed; did not report the circumstance to the police or to his officer; at the watch-house. Did not say anything of having heard the screaming, until after he heard of the woman’s death; was opposite this house at the time; but could not say positively it was from this house; saw a light in Mr. Lander’s nursery next door and did not come across the street as the noise might be from there. To a Juror – The screams lasted about 8 or 10 minutes; could not tell if they were those of a woman or a child; they became very weak. Coroner – I will certainly feel it my duty to recommend to the authorities to dismiss you from your situation; you certainly did not do your duty on Saturday night, and I believe everyone in the room is satisfied that you contradicted yourself several times. Dr. Kane here arrived, and after a short consultation with the Coroner, stated that it would be necessary for him to make a post mortem examination of the body, and also to analyse the contents of the stomach, which would take him some time. This day the inquest was resumed, and went to a great length. 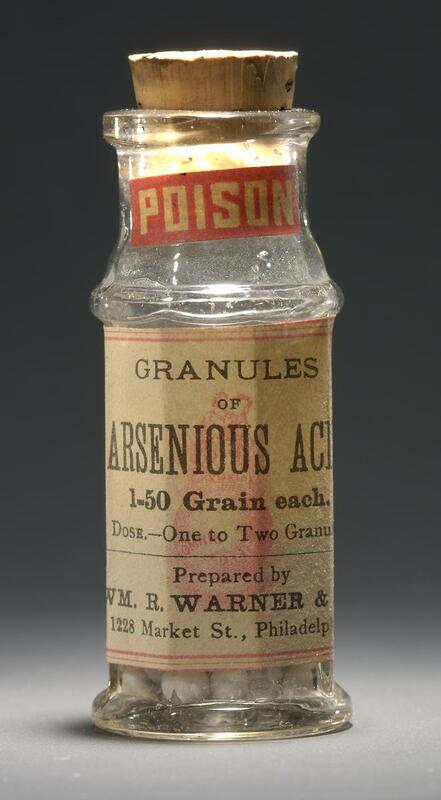 A medical and chemical analysis was proved shewing [sic] that the deceased at the time of her death was pregnant, and that her death was caused by arsenic, 30 grains of which were found in the stomach. An apothecary, a Mr. Cleary, proved that a man came into his shop “on Sunday week or fortnight” and handed him a paper containing the words “1d. worth of poison for rats,” but he refused to sell it to him. The witness swore he had a distinct recollection of the man’s person, though he had not previously known him. A variety of evidence followed, of the most confusing and contradictory character, in which it was asserted that the deceased’s pregnancy resulted from a connexion with John Haynes, the brother of her employer. One of the witnesses, a woman, stated that a man in the employment of Mr. Haynes, a person named John Slattery, stated to have appeared on the trial to be a combination of knave and fool, told her that deceased said to him she would go for a pennyworth of poison for rats; “witness said the girl never told him any such thing, and then he called her aside, and said that the master and mistress and Mr. John told him to say so, and that he would leave the house next morning, and would not come to feed the pigs.” This man was brought up for examination, but appeared to fall into an equileptic [sic] fit when he was asked a few questions, but jumped up when the Coroner told the police to take no notice of him. Very interesting read; thanks so much.